At First Glance... the Unparalleled Quality of the Hydro~San Plus is Unmistakable. design and even our remarkable eco-friendly finish, combine to create an extraordinary system for professional Colon Hydro-therapy. Underneath our impressive exterior lies the heart of the Hydro~San where Decades of research, development, testing and three decades of unwavering commitment to quality, safety and our profession come to life. The Cleansing Unit permits cleaning and disinfection of the waste assembly of the HYDRO~SAN Plus Base Unit. The reservoir should be filled with disinfectant solution as outlined in the user manual that comes with your machine. 1. 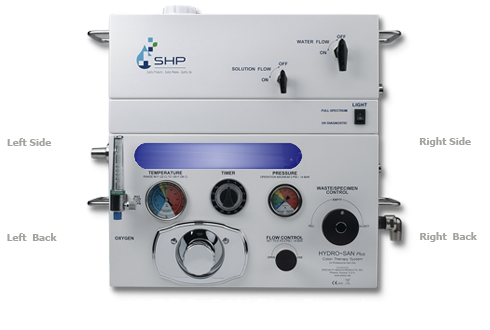 High Flow Water Rinse: Thoroughly flushes remaining residue from the HYDRO~SAN Plus Unit. 2. Sanitizing Solution: Pre-mixes automatically and virtually cleanses the entire system. 3. A Quick Rinse: sends filtered water through the system, removing any remaining cleansing solution, leaving your HYDRO~SAN Plus unit cleansed, rinsed and ready to go. 1. COMPLETELY ISOLATED ELECTRICAL: We are the ONLY Company in the world to completely Isolate our Electrical System from any water Usage. (We are not Shock Resistant – WE ARE SHOCK PROOF). 2. Energy Efficient, LED Full Spectrum Light, 50,000 Hour Lifespan, relieves eye strain and improved color diagnostics. 3. The World’s FIRST and ONLY Dual Lighting System. (Full Spectrum and U. V. Diagnostic Black LED Lighting). Clinical Black Light Diagnostic capabilities combined with our Chemical / Parasitology Curriculum and the FUTURE of Professional Colon Hydro-therapy. A League of our own ... Where do we even begin. 1. We eliminated 97% of brass, reducing toxic leaching temperature variation and environmental hazards. Medical grade connectors are non-toxic, no-leak, and safer for the environment. 2. Our Internal Water Mixing Valve is from the World’s Premier manufacturer and our color coded  gauges are custom made for accuracy and dependability. Only the Best of the Best. 3. The Patent Pending Manifold System is the secret to our safe and gentle water flow. 4. All the Features for a Professional Environment; Additive Capabilities, Oxygen Administration, Specimen Collection ... The Hydro~San Plus does it all. It's Not "A Colonic". It's Colon Hydro-therapy. KNOW THE DIFFERENCE.